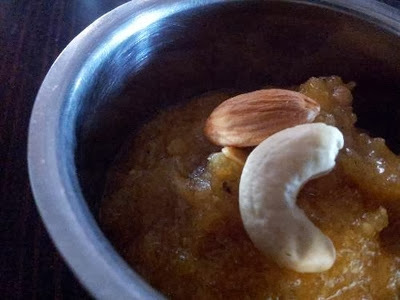 Kasi Halwa is the traditional sweet made of pumpkin and served in marriages. 1) Squeeze the grated pumpkin with hands to remove excess water. Squeeze nicely to make sure the pumpkin is not moist. This 2 cups measurement is the measurement taken after squeezing. 2) Heat a tbsp of ghee in a kadai, fry Cashews and Almonds and keep aside. 3) In the same pan with rest of the ghee, add the pumpkin and saute it till it gets cooked (approx 10-15 mins in medium flame).Keep it aside and in the same pan add sugar and 1 cup water. 4) Once sugar gets dissolved, add a tbsp of milk to remove the dirt.When you add milk, the dirt will float and you can remove it using a spoon. 5) Let it boil for few more mins to get light stickiness. 6) Now add pumpkin, khova and kesar color and stir them continuously for 5 mins. 7) Add 1/4 cups of ghee little by little and stir well. Stir continuously till you get halwa consistency, and leaves the sides of kadai. 8) Turn off the flame and add cardamom powder, edible camphor, ghee and nuts and mix well. Yummy Kasi Halwa is ready. 1) The water you get from grated pumpkin is so good for health. Instead of discarding, you can add to Sambar or Rasam. Or add few drops of lemon juice and honey to make a healthy drink. 2) Make sure when you sauté the pumpkin, stir it continuously and should not get burnt. 3) You can alter the sugar quantity as per your taste.